Hello, and thank you for visiting my web site. As you can tell from the pictures, I am a family-oriented CPA. I am very blessed to have the support of my wonderful wife, Jeanie, and my awesome daughter, Emily. 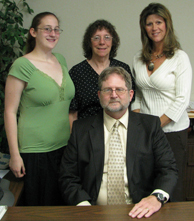 My secretary, Vicki, also pictured, is family too as far as I am concerned--and as a client, you will be treated like family also. In fact, I guarantee you the same personalized quality service and attention to detail a family member would receive. Give me a call today and let me help with your tax and financial needs. Also, please explore the different links provided here to receive valuable information concerning your taxes and finances. Thanks, and God Bless!